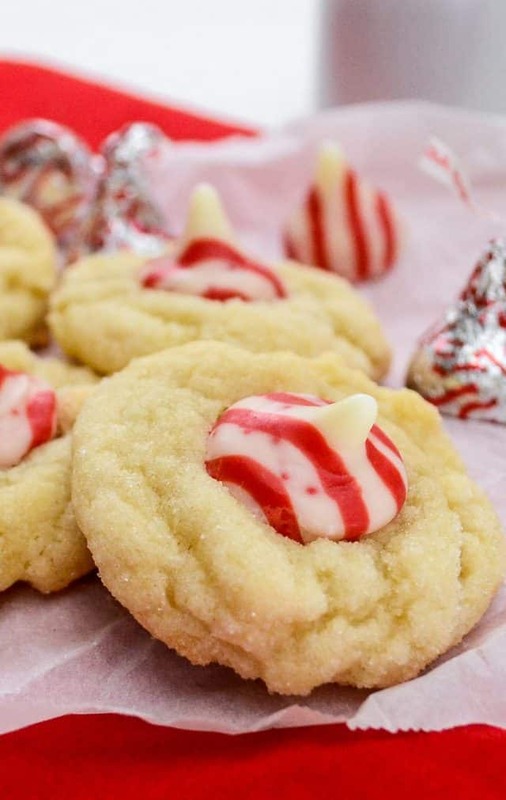 These white chocolate Peppermint Blossoms are a blossom cookie recipe made with pudding mix and white chocolate and topped with a peppermint kiss! I have this roll of Christmas wrapping paper that has magical powers. No matter how much I use it each year, it never reduces in size. I’m not kidding, really. It’s not even pretty paper, just green with gold writing. I don’t even like it much. But it never goes away, regardless of how much I try. Every year, I wrap the largest gifts in it. Huge boxes, at least 2 or 3 every year. Plus others. Every. Single. Year. Other rolls of paper get used up. Beautiful papers are long gone, and my ugly green one is still kicking. Guess how long I’ve been using the magical paper. Just go ahead…take a guess. I’ll wait. This Christmas will mark the 12th Christmas I’ve used that paper. TWELVE years. And guess what? Mel bought that roll of paper before we even started dating. So it’s older than that. The roll of paper is over a decade old. It gets used every year. And there is STILL a 2 inch diameter of paper on the roll. He doesn’t remember where he bought it, but I have a feeling it was Elves R Us. You know what doesn’t magically grow and reappear each time you use it? Cookies. Life just isn’t fair sometimes. Because these cookies? If they became magical and multiplied like gremlins, I’d be a happy camper. It’s a white chocolate pudding cookie with melted white chocolate in the batter. Then they are topped with a white chocolate Candy Cane Hershey’s Kiss. Triple the white chocolate goodness in one small cookie. And then peppermint. Oh, peppermint, how I love thee. 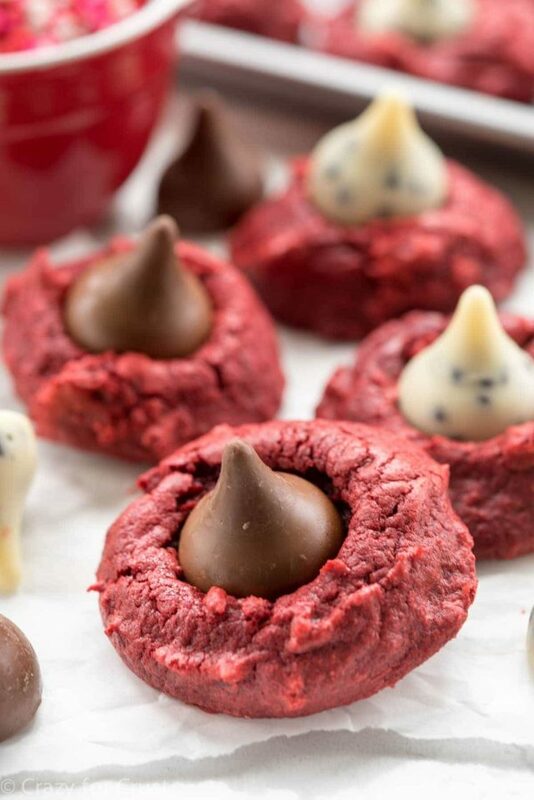 If you’ve ever wondered how to make cookies with Hershey’s Kisses, this is the post for you. Don’t like peanut butter? No problem – make these Peppermint Blossoms instead! Have you ever wondered how to make blossom cookies without peanut butter? 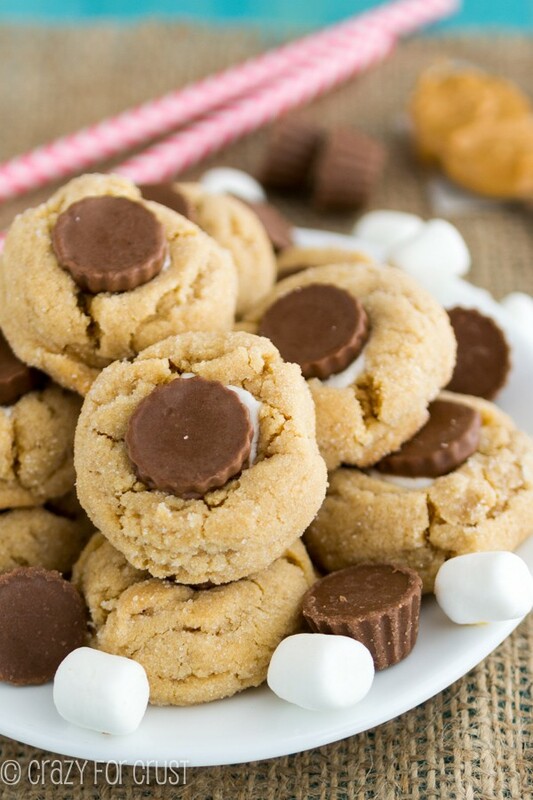 Blossom cookies got their name back when someone won the Pillsbury Bake-Off with a Peanut Butter Blossom cookie. Now, those are fabulous, and I make them every year. But sometimes you want a cookie that’s not peanut butter. Plus, Hershey’s has all sorts of fun kiss flavors now, so why not use them? This recipe starts with my favorite pudding cookie recipe. It’s got melted white chocolate in the batter and uses white chocolate pudding mix. 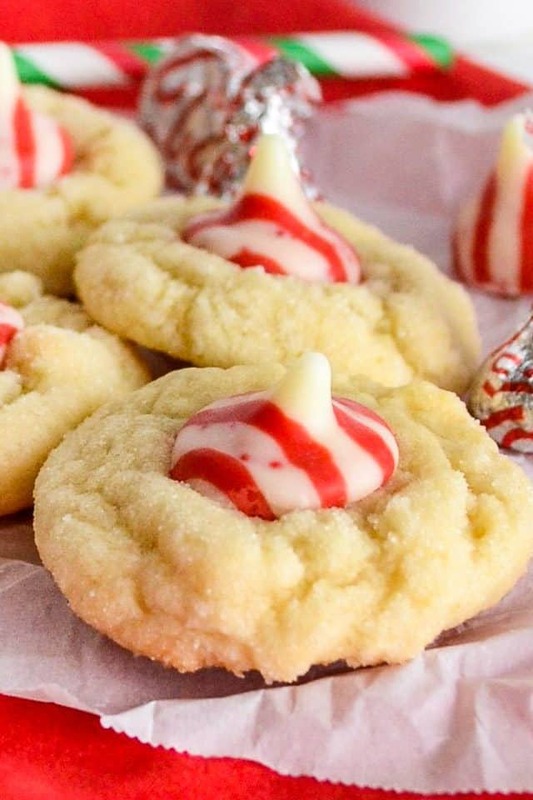 Once you bake the cookies you add a peppermint kiss on top to make the perfect Christmas cookie! If you can’t find the white chocolate pudding mix, just use vanilla. Be sure to use INSTANT pudding mix! You don’t have to roll them in sugar before baking but I like the nice texture it gives. Once you add your Kiss on top, be sure to let them cool completely. Candy Cane Kisses are less stable than regular ones so they will collapse if moved. 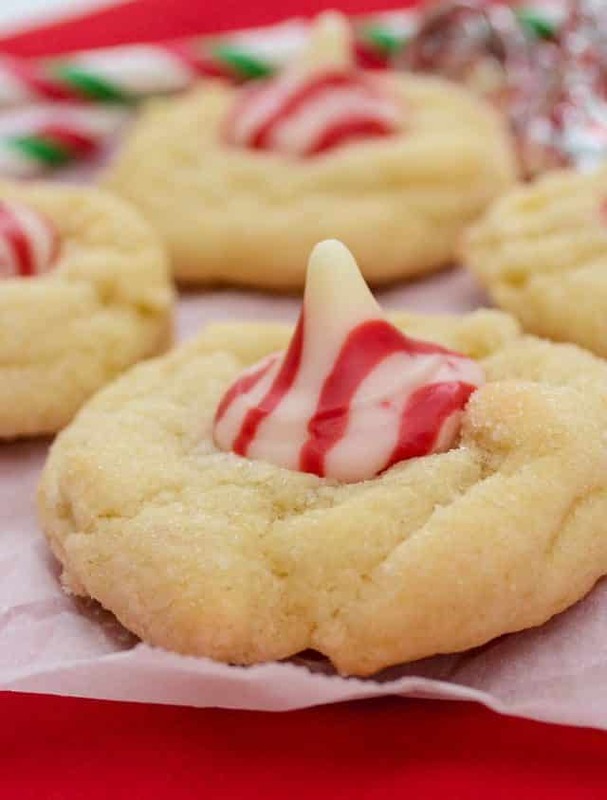 These Peppermint Blossoms Cookies have triple the white chocolate flavor with pudding mix and melted white chocolate! Cream butter and sugar in the bowl of an electric mixer fitted with the paddle attachment. Add pudding mix and blend until combined. Add white chocolate and mix until mixture is smooth. Add eggs and vanilla and beat until combined. Mix in baking soda and flour. Chill dough for at least 30 minutes. Scoop one tablespoon balls of dough and roll in sugar, or just place on cookie sheet. Bake 7-9 minutes until bottoms just begin to get golden. Remove from oven and immediately press an unwrapped Peppermint Hershey’s Kiss on top. Do not move pan until Kiss is cooled, or it will collapse. Cookies can be frozen for later consumption, if desired. Place in a ziploc bag between layers of paper towel for best results when freezing. This post was originally posted in 2012, updated 2018. Alright girlfriend….does that paper have gold scripty-kinda letters….and did it probably come from Costco? Cause I have that same dang roll!! The roll that never dies! I hate it! I hate it so much I never use it, but I can’t bear to waste it and throw it away…so you know who uses it? My husband! To wrap my gifts! I’m thinking there has to be some sort of wrapping place donation place…like where they wrap your gifts for you for a donation. They would totally appreciate a wrapping paper roll that never ends, right! Ugh ugh ugh, couldn’t find the white chocolate pudding!!! I’ll keep looking, but I may have missed the curve!! Oh no! I know that different stores have different flavors. I can find the Jell-O brand and the Hershey’s brand at Walmart! I made the first batch of these and they came out completely flat! What did I do wrong? Can I do anything to fix the rest? I am not much of a baker so I guess I shouldn’t experiment, but they looked so good. Oh no, I’m sorry Tracey! The best fix I’ve had for flat cookies is to chill them. Did you chill the dough and they still flattened? They are flatter than a traditional PB blossom, but not pancake thin. If you try them again, try scooping the balls then chilling. They get super hard that way, and won’t spread as much! How do I melt the white chocolate? Can I do it in a microwave, carefully? 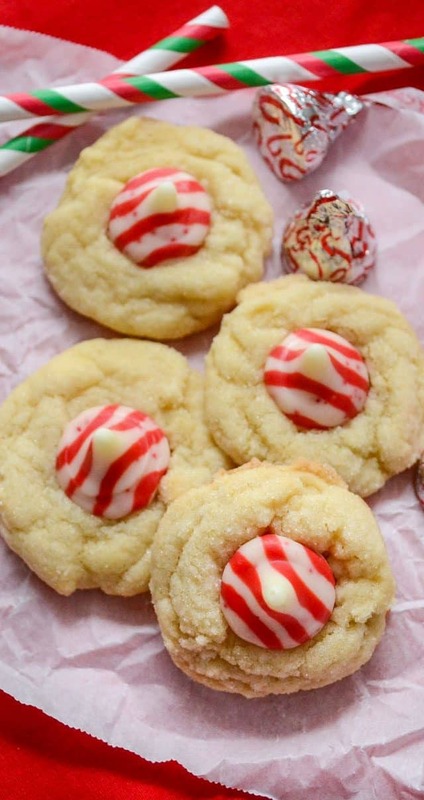 I’m done baking but I think I HAVE to make these, I LOVE white chocolate and peppermint….they look so pretty! You can do it one of two ways: in a double boiler or the microwave. Double boiler is the best method (but I usually use the microwave): you place a bowl on top of a pot with 1 inch of water and bring it to a boil (just make sure the bowl is not touching the water) and stir the chocolate until it’s melted. In the microwave, I usually do 50% power for white chocolate on increments of 30 seconds, stirring after each increment. If it has trouble melting, you can usually add a bit of veg oil or crisco to help it along.